Communication is vital in any business partnership, but when it comes to network marketing, especially online where you have little to no personal contact with your downline, it’s critical. After several months of really kicking things into gear with SFI, I see the tools that they have provided and realize they are absolutely essential to my business. Pretty much any online program is going to provide you a way to email your downline in bulk, or mass, email. But SFI doesn’t stop there. Heck, that’s not even where we start! When a new affiliate signs up with SFI, their sponsor is notified either via email, text, or both, depending on their notification selections. Once the sponsor visits the site again, it will notify that person that they have a new affiliate through a pop-up notification. Clicking on this notification takes you to the genealogy viewer, where you can find your new Personally Sponsored Affiliate (PSA). The first tool I take advantage of here is the new “icebreaker” tool. By activating the icebreaker, the next time the affiliate logs in, it will invite them to visit with me via email, SFI chat (more on this in a minute), or select “maybe later.” So far, I’m running about 35% response from this communication tool. As soon as I set up the icebreaker, the very next thing I do is to send out a Welcome e-card. These are also provided by SFI and are made very readily available for all sorts of occassions. Boom! Now they will get an e-card in their email from me, welcoming them to SFI and inviting them, again, to contact me. Last but not least is the SFI chat. 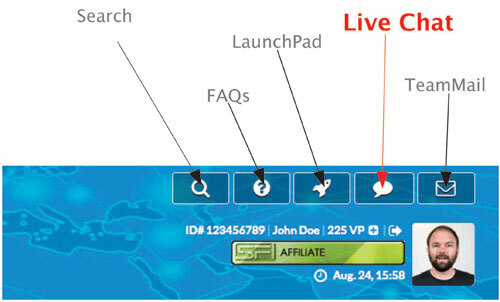 This is a chat feature that is built into the SFI website, and works both on desktop and mobile versions of the site. If I see that the new affiliate’s online (indicated by a green bubble next to their name), then I will pop in and say something along the lines of “Hi! I just happened to be online. Welcome to SFI! Let me know if there is anything I can help you with. :)” This gets a response about 50% of the time, if they are still online. There are many different methods to do all of these thing through companies that are out there doing network marketing online today. I just feel like SFI has taken the bull by the horns and really made communication important. As a result, team building becomes just a little bit easier in this age of global business building via the internet. 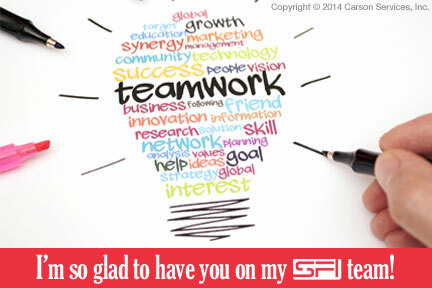 JOIN A WINNING TEAM WITH SFI TODAY! If you do decide to join my team, I’m behind you 100%. We have excellent training resources, including a private forum and Facebook group. It’s free to join and take a look around. What have you got to lose? PS – Tell me you came from Earning Real Money Online and I’ll have a surprise gift to help you get started!